Moritz Lager is a genuine beer from Barcelona, Spain. If you do enough eating, drinking or walking around in the city of Barcelona, the signs are hard to miss: a big, blue M on a canary yellow background, announcing the return of Moritz beer to Spain‚ Catalonia region. Moritz has a smart look that‚ is somehow both nostalgic and modern looking. 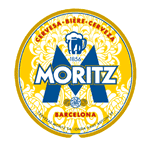 Moritz beer is made by cooking pale ales, and using water from the Font d'Or in the Montseny-Guilleries massif that belongs to the Vichy Catalan company, with which Cervesas Moritz has reached an agreement for the water supply to be sent directly from Montseny springs. Also, the beer is perfumed with an infusion of aromatic hops flowers from Saaz (Czech Republic), that give it a characteristics and extraordinary aroma. In short, Moritz is a beer with a very special flavour that brings together the experience inherited by the founder and the successive beer maestros of the company to, through the traditional production method, offer a unique and authentic flavour.